As lawyers for the union representing striking workers at Thunder Bay's Port Arthur Health Centre and clinic administration prepare to return to court, an expert in labour law says prolonged disputes often destroy relations moving forward. 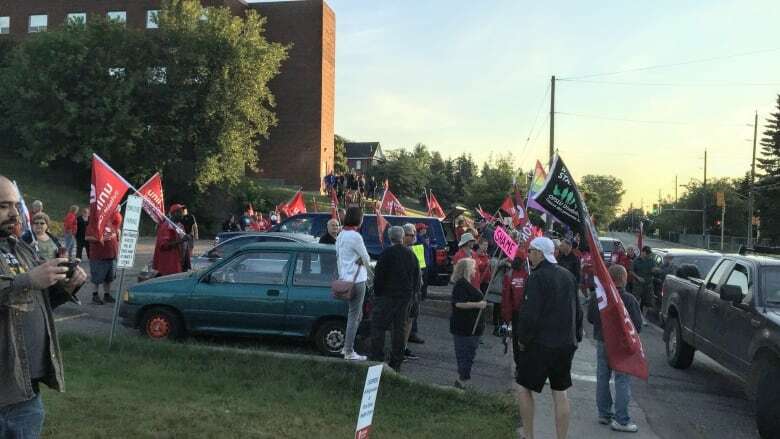 Legal counsel for Unifor — the union representing 65 support staff at the medical facility — and the health centre are scheduled back for an injunction hearing Friday afternoon. Clinic administration sought the injunction to limit strike action after the union ramped up its efforts on Wednesday, effectively shutting the health centre down. "These things generally will just wind down with the party that has the greater economic clout eventually being victorious but with ... blood from both sides being on the ground," said Michael Lynk, an associate professor of law at the University of Western Ontario, who specializes in labour and human rights law. "Strikes are difficult in any event, they generally darken good relations for a long time after the strike is settled," he continued. "But strikes which involve replacement workers crossing picket lines generally just add more poison to the relations." Since the strike began on Apr. 9 and until Wednesday's escalated job action, replacement workers were being used to keep the clinic running. Employees who work as medical aides, appointment secretaries and medical records workers are among those on the picket line. Despite the interim injunction being handed down Wednesday, strikers were not strictly adhering to its conditions, including allowing access to the clinic and not picketing on clinic property. A Unifor spokesperson said on Thursday that the union will continue to deny access to the building until the health centre comes back to the bargaining table. That can be a risky move, Lynk said. On one hand, he said Unifor used a similar tactic during a recent strike at a mine in Goderich, Ont., which helped bring that labour dispute to an end. However, he continued, it can also backfire. "If that doesn't happen and you have a particularly stubborn employer, they are in a better position to persuade a judge to make the terms of the injunction more onerous on the union," he said. "Unions gamble when they defy an injunction." Lynk said that can also include fines and even jail time for those found disobeying a court order. Late Thursday night, Unifor issued a written statement saying that they presented an offer to the health clinic "to settle the 124 day long strike." "The offer is fair to both sides, and more importantly would pave the way to quickly reopen the health centre so patients can get the health care they need," Unifor National president Jerry Dias said in Thursday's statement. No details about the offer were provided in the statement. In its release, Unifor said it again asked the clinic to return to the bargaining table and negotiate "a fair deal."